Access to the Preferred Club Lounge with Concierge Service. 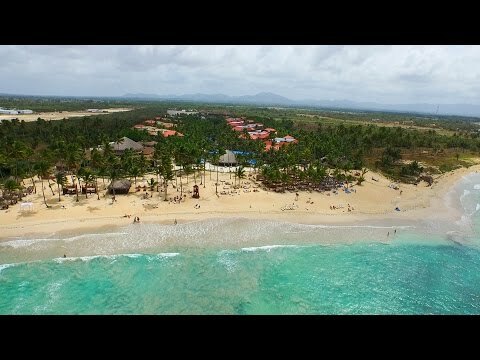 Dreams Punta Cana Resort and Spa is a stunning beachfront resort located only 45 miles (72 kilometers) from the Punta Cana International Airport. This unlimited luxury resort provides an environment of elegant luxury for the whole family. Along one of the finest beaches in the Dominican Republic, Dreams Punta Cana Resort and Spa is the perfect getaway for couples, families, and friends. Dreams Punta Cana is the winner of the Best Family Friendly Resort and the Best Pool in the Caribbean for the TripAdvisor Traveler`s Choice Awards. In addition, this spectacular resort was voted #8 Best Destination in the Caribbean and Mexico for the TripAdvisor Traveler`s Choice Awards. Dreams Punta Cana is also Rainforest Alliance verified. Dreams Punta Cana now welcomes small dogs (under 22 lbs. or 10 kg) in their accommodations and on property. This service is available for $65 USD per night, in specific room categories only. Only small dogs are permitted. please contact reservations by emailing reservations.drepc@dreamsresorts.com. To check availability Guidelines, restrictions and availability apply and are subject to change at any time. Required upon check-in: Dog`s name, weight, age, color, and breed for identification purposes during their stay. Vaccination certificate from veterinarian proving Bordetella and Rabies vaccinations within the past 12 months. Evidence that a current treatment for fleas and ticks is in use No more than one dog is permitted in any Guest room. Dog is allowed only on designated dog area(s) of the hotel grounds. Dogs are not allowed in the Pool, Fitness Center, Spa, Retail shops, and Golf facilities Due to local regulations, dogs are not allowed on the beach. Dog must be on a controlled leash at all times or in a dog carrier when not in the Guest room. Guests are responsible for cleaning up after the dog on resort grounds and properly disposing waste in designated areas. Dogs cannot be left alone in Guest rooms for periods longer than two hours. Guest must notify the front desk and hang the Dog Friendly Room door hanger when leaving their dog unattended in the Guest room. Guest must answer the cell phone number provided to the resort while their dog is unattended in case there are any issues. Dogs must never be left alone overnight. Please contact the concierge if boarding recommendations are needed. Guest room cleaning services will not be carried out unless the Guest is present. The dog owner must be in the room if the dog is present when the Guest`s room is cleaned, in order to not frighten the pet and to avoid the risk of a pet`s escape. Please contact the concierge to schedule convenient cleaning times. There are seven restaurants to choose from, including six a la carte, with cuisines ranging from seafood to Japanese, to in-between. There are ten bars, including a sports bar and a disco. Oceana: Serve Breakfast and Lunch for Preferred Club guest. At night it is open to all guest. You`re never far from one of the resorts ten indoor or outdoor bars and lounges for Guests ages 18 and older. All serve unlimited top premium name brands, another one of your Unlimited-Luxury privileges. Wine Cellar - (fees apply) paid directly to the resort. Enjoy a private dinner with your family and friends in the wine cellar located between Oceana and Seaside Grill. They offer a wide variety of white, reds, roses and bubble wine as well as fine champagnes. The sommelier will be happy to provide personal recommendations, whether you`re a newbie, a seasoned taster or somewhere in between. Sports and activities organized by the entertainment team in the Core Zone. Daily organized entertainment, board games, pool billiard, ping-pong, foosball tables, TVs and video games available. A bar with soft drinks and snacks, baseball cage, Wii, Play Station III, Xbox, climbing wall and much more! Teen disco at the Core Zone from 8:30 P.M. to 10:30 P.M. Non-alcoholic cocktails and beverages served for those less than 18 years old. Kids ages 3 to 12 will enjoy the Explorer`s Club, which includes a pirate ship water slide, a playground area, big-screen movies at night, indoor game room, and weekly camp-out adventure. Get treated and pampered at the full-service world-class spa with a vast array of rejuvenating therapies. Services including hydrotherapy, Swedish saunas, steam rooms, and massages. At the beauty salon, enjoy European manicure and pedicure whirlpools as well as professional hair styling and treatments. This beautiful resort is surrounded by an expansive, free-form, award-winning swimming pool that reaches from the lobby to the beach, chlorine is added to this water. Wedding in Paradise Package: This is complimentary when booking at least seven nights in Preferred Club Honeymoon Suite with Jacuzzi room category or higher or if five rooms in any category are booked for at least three nights. This package also applies for renewal of vows ceremony. Selling price is $999 USD or complimentary. Dreams Ultimate Wedding: 2019Selling Price: $3,599 USD August, September and October 2019 Selling Price: $3,299 USD. Dreams Ever After Vow Renewal Package: This is complimentary when booking the Preferred Club Deluxe Room category or higher for a minimum of five nights stay (if your reservations do not meet the above complimentary requirements, this package will cost you $499 USD payed directly to the hotel). Note: Request must be made at time of booking, couples will be required to present a copy of wedding invitation or marriage certificate at time of check-in. Package is subject to change without notice and is only applicable to couples staying within three months of the wedding or over their anniversary date only. 15% Discount on spa treatments cannot be applied to spa packages or combined with any other spa promotion or offer. These packages are in USD funds, once the wedding is confirmed it cannot be cancelled within six months of the date of the wedding without a fee. Cancellation penalty is $500 USD (subject to change without prior notice). Other restrictions and exclusions will apply. Please check with hotel for additional wedding packages. Promotion Details - Amenities of the promotion include: Sixth Room Will be complimentary based on the lowest total value room. Maximum number of three complimentary rooms per group. One free room upgrade for every ten rooms paid (subject to availability). $200 USD in Resort Coupons per room for individual spending (rules of use apply). Private check-in. Six rooms minimum, 3G eligible groups are considered from six rooms - it is not necessary for these rooms to be based on double occupancy. 3G is combinable with EBB`s and all promotions with the exception of No Single Supplement. Important Note: In order to receive the complimentary room(s), all rooms are required to book at the same time. For groups over ten rooms special terms and conditions apply and are on a request basis. Please contact Bookit.com groups department at groups@bookit.com. The use of Drones or artifacts that fly or float in or on the premises of AM Resorts hotels is strictly forbidden and cannot be used within the limits at this resort.